Not just another table. 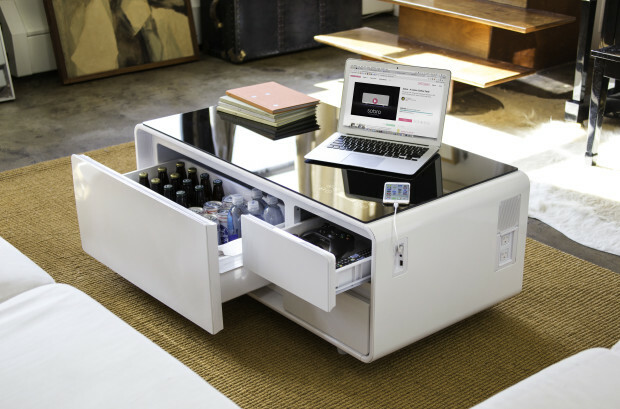 The Sobro coffee table has USB ports, power outlets, speakers and a fridge drawer for drinks. 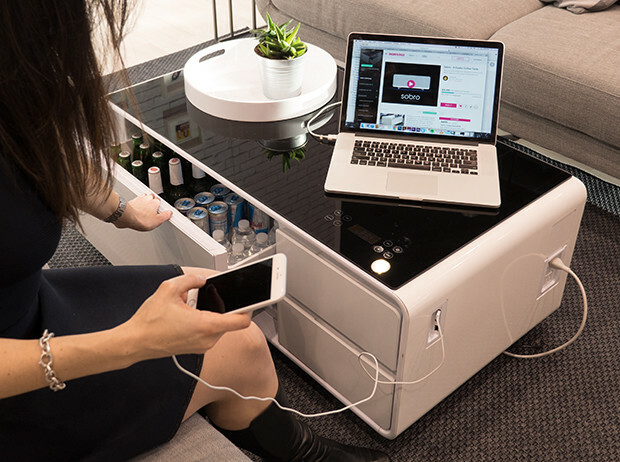 Updated: Almost a year ago, StoreBound introduced the world a smart coffee table with a refrigerated drawer, Bluetooth speakers, charging ports, and LED lights. 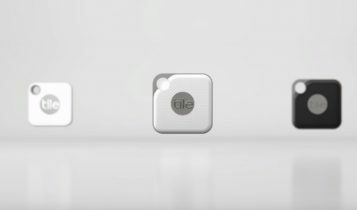 The crowdfunding campaign was a huge success with over than $1,500,000 USD raised from more than 2,000 backers. Now, StoreBound is offering its latest product, the Sobro smart side table. We all living connected lifestyles these days. 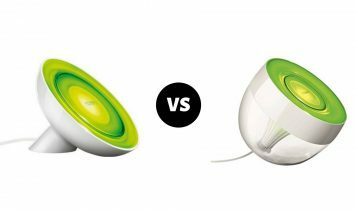 Why not have another smart product in your home. Perhaps table. The Sobro coffee table is an interesting concept that wants our attention. Not just a standard coffee table, Sobro is equipped with a variety of features, some of them are not so smart, but others are awesome. The table has device charging ports, two 110v power ports, integrated Bluetooth speakers on each side, a refrigerated drawer and fashionable LED lights. The refrigerator drawer keeps beverages and food chilled and always within your reach. 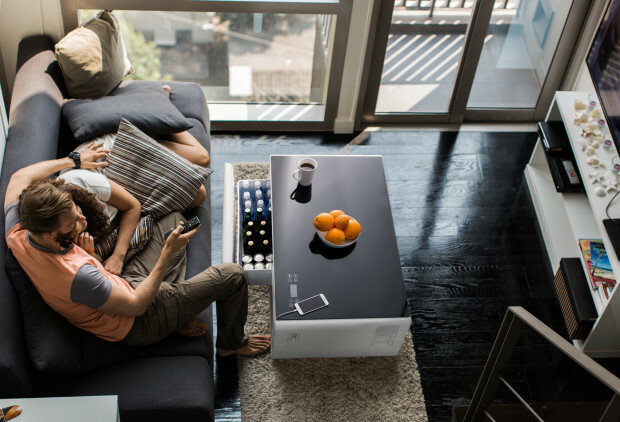 The Sobro coffee table uses a compressor to keep your beverages ice cold and features controls that helping you adjust your personal temperature preferences. Perhaps, one of the coolest features are the Bluetooth speakers. They can be sync with TV audio to work as a surround speaker system. On the top of the table surface is touch control interface, so you can control the audio, lights, drawer temperature or your phone from the table. No app download required. The Sobro coffee table is designed to be plug and play. Simply plug in the Sobro to a wall outlet and you’re ready to go. There’s no assembling drawers or building furniture just simply screw on the legs of the table and plug it in. Using a cord concealer, you can smooth the cord on the floor and put it under the couch where it’s out of the way. The Sobro Smart Side Table is not only a nice looking minimalist table, there is much more. With wireless charging, a cooler drawer, Bluetooth speakers, LED lights and wired charging with cord management, this smart side table is here to improve your life. 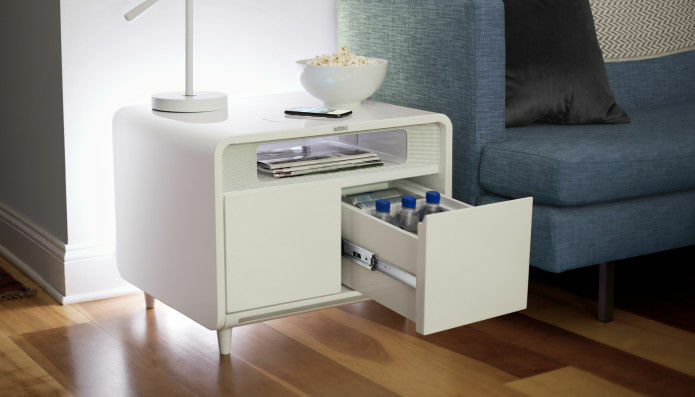 COOLER DRAWER – The table comes with a fridge with a silent operation that makes it ideal for the bedroom. Now you can enjoy a cool drink in the middle of the night. WIRELESS CHARGING – The wireless charging which can easily handle 2 phones at the same time, is built-in on the top of the table. What´s more, on the back of the Sobro side table are 2 USB ports and 2 USB-C ports along with 2 120v outlets. SPEAKERS – The table has built-in speakers that can sync to your phone via Bluetooth. Just pair two Sobro units together and get better audio. SMART NIGHTLIGHT – The LED light bar on the front of the table is activated by motion to help you safely walk in the dark. The range for the sensor operates in a 35-45º angle and 3-meter circumference and features 2 colors, warm white and bright white. The duration that the light stays on, the color and brightness can all be controlled in the Sobro App. The Sobro Coffee table was designed by StoreBound. Launched on Indiegogo in March 2017, the unit was a runaway success on the crowdfunding platform with well over 2000 backers pledging upwards of 1.5 million dollars to bring the smart coffee table to life. Sobro coffee table is already available on Amazon. Interested in the latest smart side table? 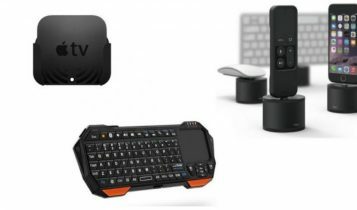 If so, you can back the Indiegogo campaign with as low as $399. That’s not a bad price to pay for a table with Bluetooth speakers, silent cooler drawer, wireless charger and a smart light system. The funding goal has been met and shipments begin this October. Sobro is a crowd-funded Kickstarter project that has no guarantee of succeeding. This article is not an official promotion of Sobro, and we at Nechstar are not responsible if the project does not succeed through crowdfunding. We are trying to introduce our audience interesting projects that have a high chance of success, but you, the reader, assume all responsibility by pledging your money to this project.